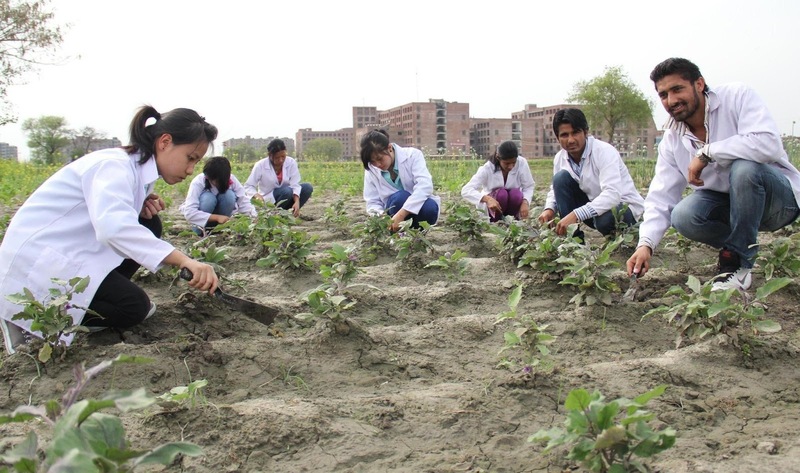 Jalandhar: Countering conventional farming based on harmful chemical fertilizers and toxic pesticides usage; LPU’s Department of Agriculture is venturing production and promotion of organic farming yields on its campus. Hundreds of its B Sc Agriculture (Hons) students have engaged themselves to learn healthy, sustainable organic farming practices through their teachers at the University. Students are regaining wisdom of agricultural heritage and learning how organic agriculture enriches the soil, increases the long-term yield, nutrient value, and potency of crops season by season. Students are practically learning organic farming practices for different crop growing procedures like sowing, seeds identification, sprays, modifications etc. University has also launched B Tech Agricultural Engineering Programme from this year. Students’ hitherto organic yields of Spinach, Cauliflowers, Cabbage, Turnip, Radish, Carrots have been well accepted by local consumers at University, who have liked these for quality, taste, appearance and appeal. They have also produced organic wheat. Now, students are gearing up to expand product offerings and presence making in global markets as well. Plans are being made for exotic vegetables, fruit growing and export marketing in European countries by adopting quality control parameters. Students have started working on the production of Baby-Corn, Parsley (Kind of Coriander), Lettuce (Green Leaves), Dill (A Fragrance), Lemon Grass and other. They have also worked for growing and marketing of all types of summer vegetables. In addition, they are learning Green House (Poly House) production, Tissue culture, Collection of Plasma, usage of natural resources & compost, floriculture, and above all entrepreneurship value for a valuable growth on even a small piece of land. In fact, farmers today have lost much of their ancestral farming knowledge and ancient seed varieties since the introduction of chemical based commercial agriculture and hybrid seeds. In many places trees have stopped bearing fruit because the heavy use of pesticides has killed the pollinators – the bees and butterflies. Valuable medicinal and other plants are also becoming endangered because of indiscriminate commercial over-harvesting. On the other hand, organic agriculture does not allow the usage of commercial fertilizers, herbicides, pesticides and other dangerous chemicals. This creates a significantly healthier working and living environment for the farmers, their families and livestock, as well as the local wildlife. Sir/Madam I belong to a NGO and our wish to people use organic vegetable and grow in thire houses. How gets training for this and cost of training. Awwsome post!!! for healthy life. I am very interested in your blog. I am planning to keep organic plants on my patio. Your are an inspiration to me. Thanks for sharing. Regarding all aspects the blog was perfectly nice. Good information with helpful suggestions. farming science is important in any country. مزایای درمان بواسیر با لیزر در مقایسه با سایر روش های درمان بواسیر زیاد است، این مزایا در آسانی این روش، انجام در وقت کم و استفاده نکردن از مواد بیهوشی سایر روشها، استفاده از لیزر برای برش خلاصه می شود.علت بواسیر چیست؟ بواسیر یا همان هموروئید در پایین ترین ناحیه راست روده و انسداد رگ ها ظاهر شده و باعث متورم شدن آن ناحیه می شود.راه های یافتن بهترین دکتر بواسیر, پزشک بواسیر, متخصص بواسیر یا هموروئید با رشد روزافزون فضای مجازی کاری سخت نیست.